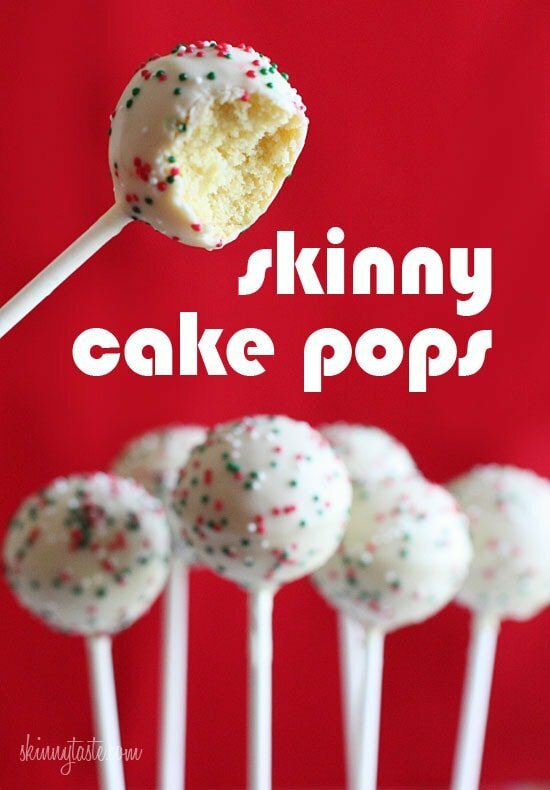 These Skinny Cake pops are made lighter by using a box cake mix, egg whites and fat free Greek yogurt – no oil, no butter required! Some extra fun holiday cake pop ideas are my Rainbow St Patrick’s Day Cake Pops, Skinny Mummy Halloween Cake Balls, Skinny Easter Egg Cake Balls, and Valentines Day Love Cake Balls. 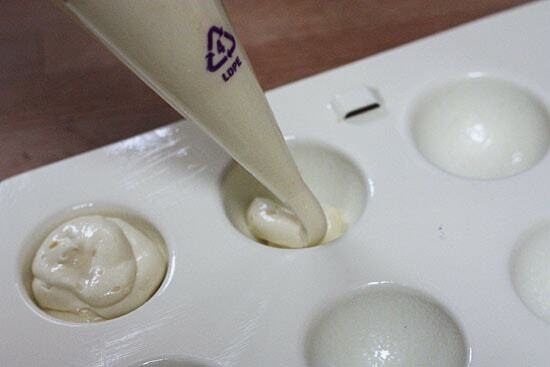 Lightly spray a the cake pop pan with baking spray. Place the batter into a pastry bag or large ziplock bag with the tip cut off. Pipe the batter into the prepared cake pop pan and bake about 18 minutes (I rotated the pan after 10 minutes to be sure they baked evenly). Let it rest 5 minutes before opening the pan. 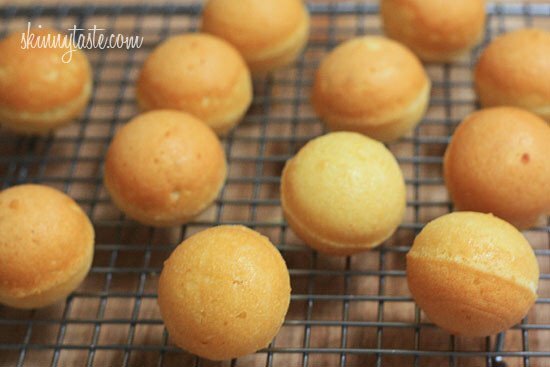 Place cake balls on a wire rack and repeat with remaining batter. Using a scissor, cut the seam off the balls. Melt some of the chocolate in the microwave according to package directions, careful not to burn the chocolate. Insert the tip of the stick into the melted chocolate, then into the cake ball (this helps hold the stick in place). In batches, melt remaining chocolate. 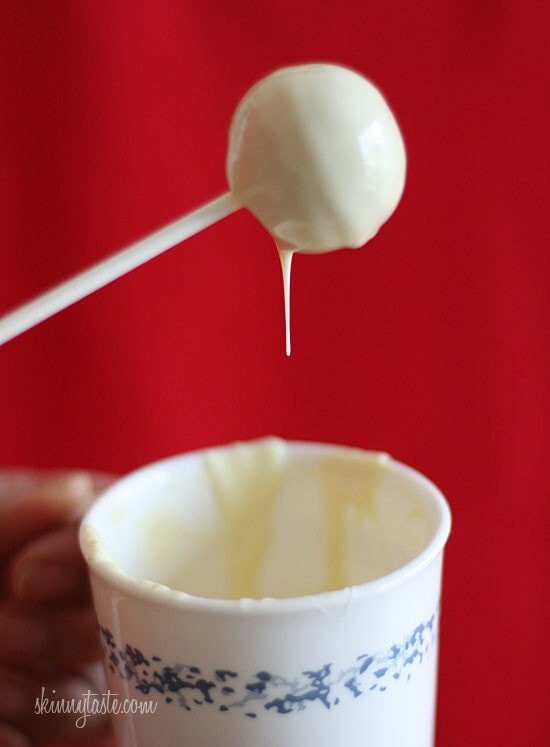 Dip the cake pops into the chocolate, let the excess drip off then place stick on a styrofoam block about a minute, then add sprinkles on top if using. Where do you add the yogurt? Into the cake mix? What can I sub for vanilla extract or can I just omit it? Was I supposed to add some sort of baking powder? Or just stick to the ingredients you listed? These cake pops look like a flavored lollypop but I bet the taste is sweeter than that of a lollypop. I realize this is quite an old post, but I'm wondering if I could get some help: just made these and the cake is so light and fluffy, the weight of the melted candy is causing them to break right off the stick! 🙁 How can I prevent this? Is there some way to make the melted candy thinner and not so "heavy"? At this moment, I have the cake balls in the freezer, to try to harden them up enough. Thanks anyone!! Do you have any tips for the chocolate coating step? The cake came out delicious but i was trying to conserve on chocolate and didn't buy enough, the trick to covering them completely really about just having too much? Also, when you made them for the cups, did you still dip on sticks? Can't wait to share these with my family tonight. Oh my, these are SO beautiful. You are really talented in the baking department! I've had Starbucks cake pops and they have the hard coating. My coating on this never got hard, did I do something wrong? Is there a secret to a hard coating? I am not a very good baker. I got my styrofoam blocks at Dollar Tree! These look gorgeous, happy belated 4th bday to Madison! If I put a dollop of sugar free raspberry jam in them, will this change the cook time or success of the recipe? I want to dip in dark chocolate w/ a raspberry center. I started by making these for my Daughter to bring to school for her Birtday! I have made them several times now, and they are such a hit. They taste great, the kids and adults all love them. They come out perfectly every time. The pan is a huge success! Thanks again for an awesome recipe! Just wondering about the white chocolate. Did u use Bakers, or the candy melts from Michaels? Could you also dip in milk chocolate? Thank you for the recipe. Can I use a chocolate cake mix instead? We are chocolate/chocolate fans here. I have the same cake pop pan as you do, and at my first attempt, the cake pops were falling off the stick when I twirled them in the candy melts, even though I refrigerated them first and dipped the stick in meltes first.Do you have any suggestions, or is there a way to possibly thin down the candy melts so they are not quite as thick? Thank you! I love this! Can you use this standard recipe with any cake mix? I have a gingerbread cake that I would like to use also. I am also having a problem with getting them round. How far do you feel the mold? I baked two batches and the bottom part bakes nice and round but not the bottom. Anyone have any idea of What am I doing wrong? Fill the bottom round of pan completely . The cake mix should rise to fill the top half. 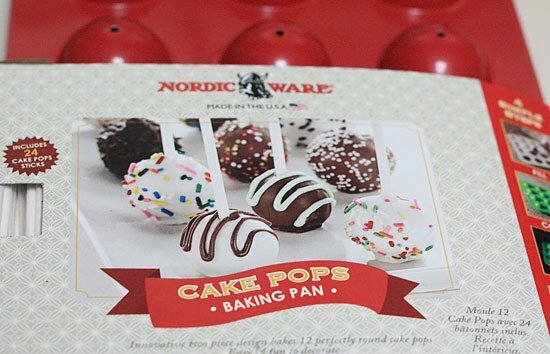 I have this exact same cake pop pan from Target and they are perfect balls every time. Good luck! Gina thank you so much for posting this. I made these for my daughter's birthday at preschool and they were a big hit! The teachers asked for the recipe so I sent them the link. 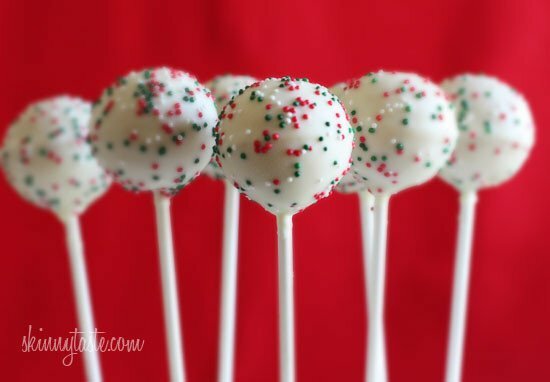 Is there a way you could make a skinny cake pop recipe with the crumbly cake/icing method, so there is not a need for a special pan? These are SO delicious and light. I used a 1/2 teaspoon of peppermint extract and crushed peppermints on the icing and they are heaven! Thanks for the great recipe. I love this giveaway! if i won it would come in perfect time for my son's 6th birthday party! Love your blog, love all your recipes!! This looks really nice and I have always been searching for a free butter cake. But can I change the white chocolate with dark one instead or not? Can I substitute the Greek yogurt for plain fat free yogurt? Okay, so I've searched through all the comments, and apparently I am the only one having this issue. I am not a baker… AT ALL, but this seemed like something even I can handle. The problem I'm having is with the chocolate. I used 11oz bags of Ghirardelli white chocolate morsels. I melted one bag at a time. The chocolate did not melt down thin enough for me to coat the pops. They would get stuck in the chocolate. What am I doing wrong?? White morsels aren't always real chocolate, so they may not melt. I suggest using Baker's or candy melts by Wilton. I had the same problem! The only thing I can do to make these work is to slowly add vegetable oil/canola oil to the chocolate melt in small amount and stir. Keep adding until it is melty enough. Instead of dipping the pop in and pulling it out, I put it at the edge of my melting bowl and turned the bowl so that the chocolate fell onto the pop. Unfortunately the oil adds loads of calories, but I could not find any other solution! I should note that I tried BOTH Baker's and Wilton and had to do this each time! I love my cake pop pan, and I use it to make perfectly round meatballs too!!! 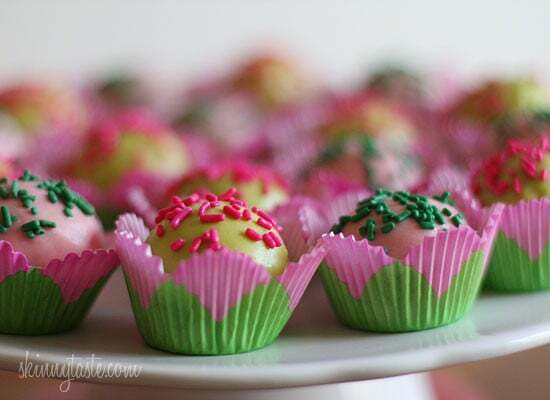 Yummy cake balls. I’m sure my kids going to love this. Keep posting simple and easy recipes like this. I found that this made far fewer than 48-50. Perhaps you are an excellent bowl scraper, but I made about 40 from the recipe. I'm also finding that I will definitely use less chocolate than listed, as well. So I'm thinking the points will just about even out. Great job Gina! Without you I would either have more jiggly parts round my middle or be miserable eating real diet food! Also for people who are worried that the trimming of the seam takes a lot of time, it is super quick and definitely worth the extra step! Happy Birthday to your beautiful daughter! These look delicious! Great idea… have seen those special pans and wondered how well they worked. Thank you for the skinny!!! Cake Pops !!! Cross my fingers & hope to win !! 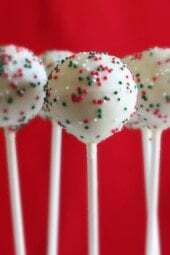 I have been trying to think of a way to make a lower calorie cake pop. Thank you for this! Do you happen to know what the points would be baking this recipe as a regular size cupcake (without the chocolate)? I don't have the cake pop pan but the recipe sounds wonderful. This is so pretty … really skinny! One of the sexiest lollipops I've ever seen! Looks very sweet for me! I'm planning on giving away cake pops at my upcoming wedding (but I'm buying them from a bakery near me)! I would love to try to make my own at home some time! I have only tried cake pops the "old fashioned" way of crumbling and adding frosting. Didn't even like then that way! Too sweet. So this would be a great win! What a great idea! I don't own a cake pop maker but this looks like a winner. Thanks for the recipe and giveaway. Love your site! Oh I love the idea of adding greek yogurt for some zing! I found this crushed chocolate peppermint bark at trader joes over the weekend. A little goes a lot way with that so I wonder if you put a tiny bit in the batter and half dipped in dark chocolate how that would work out. Would love to win this set! Such a great holiday gift idea!! What a clever way to lighten them up! I'd love the pan and book! I have wanted one of these for awhile and this really convinces me that I should get one. So cute! 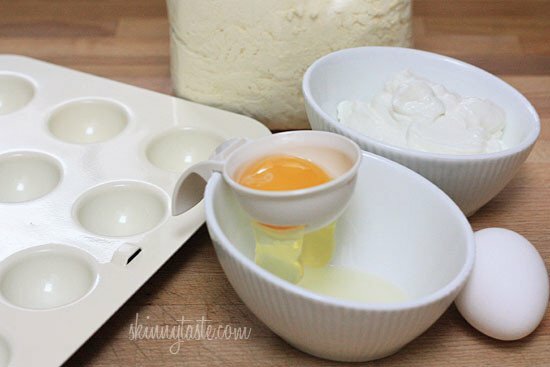 Too cute, would love to win the pan to try making some myself! And AND HAPPY BIRTHDAY MADISON , YOUR SO PRETTY !!! Have lots of fun !! 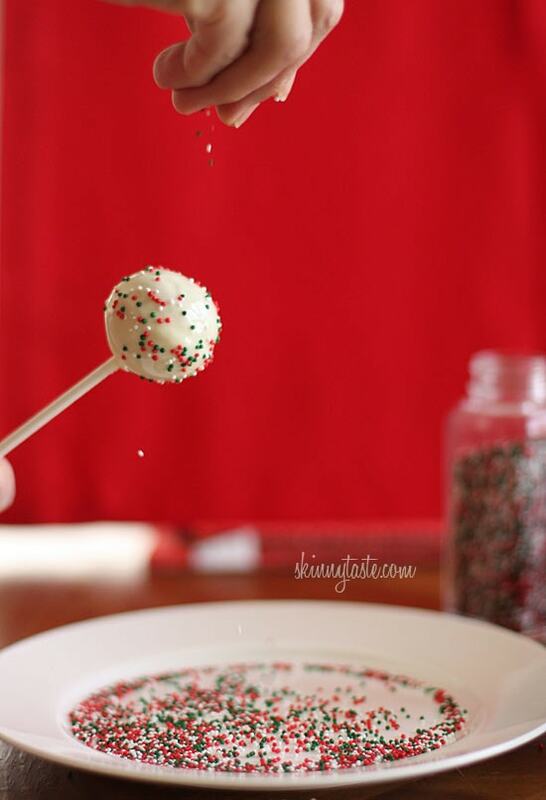 I've seen this cake pops around but have never made any. After seeing yours now I have to. Love your site. This is absolutely perfect! I love cake pops but the thought of how much frosting is usually added… *shudders* and I experienced major failure the one time I tried to make them haha. I'd love to have one of those pans! These look amazing! Thanks for the pan suggestion, I kind of figured there were probably some not-great ones out there, so I'm glad that you did the research! This one looks fantastic! I love this recipe but…what can I use in place of the yogurt for my dairy free friends? Everyone loves cake pops! It's such a cute and delicious party snack! Thanks for testing it out for us! Wow sei davvero bravissima, sono stupendi!!! This makes me want to sing "Unskinny Cake Pop, Pop, Pop" by Poison. Ohh, I need this pan in my life! 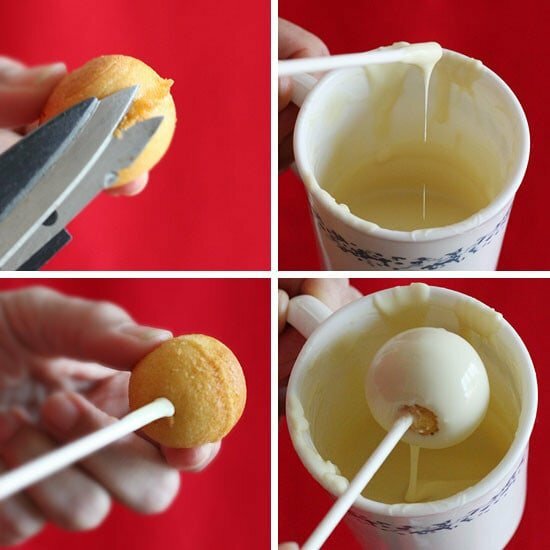 I have made cake pops the regular way, but this looks so much easier!! And I must try your recipe too! Thanks for the tip, I'm always trying to find ways of making sweets a little bit lighter. These look fantastic – Can't wait to try them! Love your site! These look great! My sister started working for a bakery and their cakepops are divine, but loaded with calories (and frosting!) on the inside. These are a great alternative, especially for my daughter's 3rd birthday, coming up on the 23rd! love your site and recipes, they are so yummy! I love all of your recipes! I wish I had a nickel for every one I have pinned! This one's another winner and I would love to win that cake pan so I can make some for the upcoming holidays! Those are just awesome! Love that they turn out perfect instead of a perfect mess! Adorable. What a nice give away! Hope Madison had a happy birthday, she is adorable! This post came at a great time – my mother in law wanted a cake pop pan for Christmas, so now I know what kind to get her! Secondly, this recipe comes at a great time so I have a better alternative than the oh so tempting ones at Starbucks! Hope you have a great holiday Gina! Your pops are adorable -almost as cute as your daughter! Thanks for the review on the cake pan. Isaw it at Target and was wondering how good it was for pops. Cake pops are too cute (and with a lite version, too)! I've been wanting to make them. Your pan would help tremendously. Such great ideas! I make the regular ones all the time, but they're so rich (and fattening!). This sounds like a great alternative! Well done! Totally adorable!!! I want to make cake pops!! How many points + without the frosting? Loving the idea of this mold. Thanks for the giveaway! You make this look so easy to do. I may try this for a Christmas party this weekend and make some for my DS 1st birthday in February. Wonder if they would freeze well if I make them ahead of time? BTW Happy Birthday to your DD! Cake pops are the best! I look forward to trying this 'skinny' version. 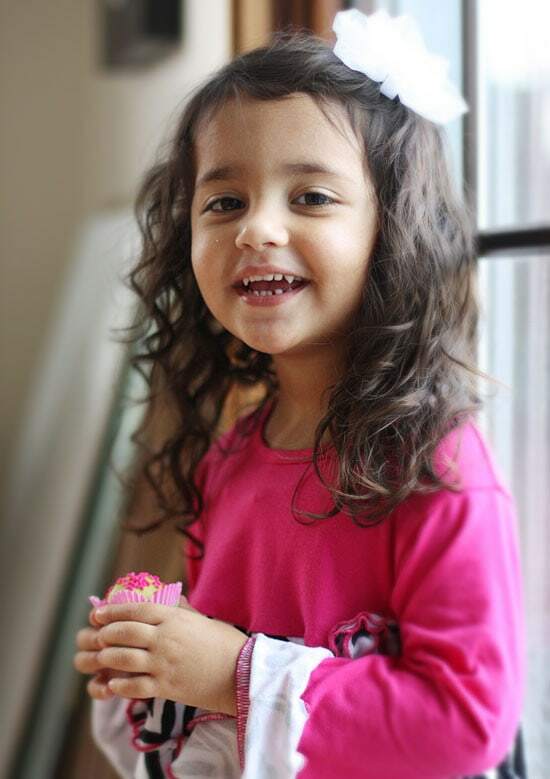 First…your daughter is just precious, and Happy Birthday to her. I have so been wanting to make these and don't have a pan, and mostly didn't know which one to purchase. Thanks for all your tips! I would love to win this pan and book!!! Thanks for the lighted up version! I love to bake! What a cute idea!!! Thanks! Yam!!! Would totally make it for New Years Party!